Are you ready to set that next KOM? The Absolute Black Spiderless GXP Direct-Mount Oval Ring is ready to rip it up with its beautifully machined, lightweight and stiff construction. Simply put, this is the best looking spiderless ring we've ever seen. Its special direct mount interface is compatible with SRAM GXP MTB cranks that feature removable spiders. Simply remove your existing spider and bolt this ring on in its place. The spiderless setup is super clean and saves a great deal of weight over a normal spidered setup. Oval rings spin smoother and promote optimal power transfer, eliminating dead spots in the pedal stroke. The Spiderless GXP Oval Ring has AbsoluteBlack's specialized narrow-wide tooth profile which retains the chain snugly, preventing dreaded chain droppage. Perfect for single ring or singlespeed use. 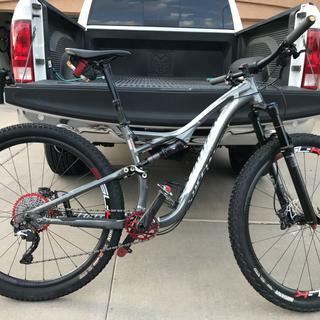 I just upgraded my Santa Cruz Tallboy LTc to 1x. After doing a lot of research, I decided to try the Absolute Black oval chainring (SRAM direct mount). My local trails are pretty hilly, so I went with the 30 tooth version. Out of the box, the ring is a thing of beauty. Very nicely designed and very well built. Installation was a snap. Simply remove the SRAM spider and rings, reapply a little Loctite to the bolts, and install the new oval ring directly to the crank. The process took less than 5 minutes. And, as a pleasant surprise, my existing chain length was spot on. To complete the conversion I added a Wolf Tooth 42t cog and a Oneup Radr cage. I read quite a few reviews that said it takes about 5 minutes to get used to the feel of the oval rings...I'm not sure it even took that long. Right from the start, the pedal action felt comfortable and natural. The rings hold the chain perfectly, even over rough terrain. And, I love how quiet it is compared to the 2x set up. The primary benefit of the oval ring is said to be improved traction. And, the Absolute Black rings do feel like they help the bike dig in. How much they have improved traction is hard to tell, because my Tallboy hooked up really well with the stock round rings. So far I have noticed the most amount of improvement when climbing over slick roots. When the rear tire breaks free on those slippery little death traps, it seems to bite back in sooner than it used to. As for durability; it's still to new to tell. The machining and quality of construction look great though. So, I would be very surprised if it didn't hold up well. All in all, I am very pleased with the ring. It works great, looks great, and really simplifies my riding. I mounted my Rockshox Reverb controller where the front shifter used to be, and now I can really get the most out of the dropper post. I can't see ever wanting to go back to a double ring set up! If you are considering going 1x, I highly recommend the Absolute Black rings! The AB 32t oval ring is awesome. It makes climbing better and more efficient. Love my AB oval ring. Worth the money. Great ride, you can feel it even out on climbs, otherwise you wouldn't know you had it. It definitely feels like you have gone one gear lower on the back ring, so climbing used to be my biggest gear and most of it is now second biggest for the same tooth count on a round ring. I was replacing a Raceface circular single chainring & decided to give the Absolute Black Oval Chainring a go. The ride: one doesn't notice a difference verses a round chainring until the terrain pitches upward; it's easier to spin on longer inclines (not spinout), and maintain a constant cadence, one also notices a powerstroke when the incline presents a ledge to climb over, when traversing level ground one definitely notices the ease to spin. The anodizing is a step above the other brand. Overall, I prefer the oval over a round chainring. Love it but needs to be more durable. The anodising is cosmetic and it wears quickly. I'm on my third now on just under 1000 miles riding. I wanted to try oval ring based on a recommendation. Installed this on a singlespeed mtn bike. I had been running 34x18 and was going to upgrade to 34x17, but first tried the 34t oval ring with the same 18t rear cog. It installs fine, did not require adjusting the chain tension, and does not have too much chain slop. It feels a little different to pedal but not much. However I don't like it. Overall it is harder to pedal when climbing than a round 34t. On flats the easy part of the stroke is annoying, slows you down, and could lead to knee injury from the varying forces at high cadence. As to the claim of better traction, I'd say the improvement is minimal. In 2 test rides of 20 miles on my regular trail, I am slower than the rides immediately before, which were PRs. I'll give it another chance and then I'll be returning it if I don't see a benefit. In a nutshell, I am working harder to go slower. I had a 34t oval ring. Needed to downsize to 30t. Getting old. I miss a little of the speed and acceleration of the 34t but my lungs thanks the 30t. It's a good tradeoff for me as I don't race. As always delivered quick with no snags. Super fast shipping from Jenson! It definitely feels like I'm getting a little assist when climbing. I can drop down a gear or two also. Should be call absolute bright instead of black! A friend talked me into this product. I'm glade he did this is a great product. I'm a machinist by trade and the workmanship is some of the best I have seen. Also your service was great. You know what they say. Once you go absolute black you never go back. I trie to go back it's not the same anymore. Works perfectly, no dropped chains, pedaling feels smooth. Just raced ouachita challenge 60 mi mtb race and it worked great. Not sure how but it is also quieter than the stock xx1 after muddy creek crossings. Don't have a nick name. Lol. This ring is great to maximize the power stroke and minimize the weakest portion of your pedal revolution. It is well made, switched out easily on my SRAM GXP crankset. Made of lightweight Aluminum. Great service, fast shipping, best price and most importantly IN STOCK........other vendors said they had in stock but when you drilled down on their site it wasn’t. High quality product. I thought it might feel odd pedaling with an oval chainring, but it felt really natural and I felt an efficiency boost. Highly recommend this product. Jenson delivered quickly and had a great price. Nice chain ring build well. This thing is really nice for climbing. Best oval rings in the market! I love oval rings. You will have a smoother and more flowy ride especially in bumpy/rough climbs. Ive raced with oval rings for the past 2 years and have no complaints. The Hype is True, worth every penny! Really makes a difference in precision and smooth acceleration up steep climbs..... worth every penny! I purchased the Absolute Black Oval Ring for the long climbs I ride and glad I did. I found it not only improved my segment times but evened out my cadence on all types of trails. I'm very happy with the Oval Ring. This ring really changed my MTB experience more than just about any other component. Climbing and sprinting feel so natural on this ring. There are no deadspots on the crank rotation, but more than that, climbing traction has been greatly improved. Some sources report that it takes a few minutes to get used to oval rings, but I got used to it instantly. Works for my purpose. Anodizing looks good, color in photo reflects actual color of product. Looks great, oval and narrow and wide teeth. Doesn't drop a chain, strong. This is my second and I'm not going back. This is my second oval ring, and at a lower 28T, its more noticeable yet unnoticeable. First things first, forget the notion that these ride as fat as a gear two teeth bigger, but climb like a gear two teeth smaller. That's simply not true. What it does do - and well - is more evenly distribute the torque in your pedal stroke. By acting like a higher gear where your foot has the most leverage, it reduces applied torque to the rear wheel. Then in the dead spot of your pedal stroke, it acts like a smaller gear, allowing more force than normal to be applied. These two features help reduce fluctuations in applied torque, meaning youre much less likely to blow off the tire on a loose or technical climb. You might think that this manipulation of applied torque makes the bike like it surges every pedal stroke, but in practice the opposite is true. The ring actually feels "rounder" and more even than a round ring does. Anyway, for high torque applications where you need to maintain traction, I'm a firm believer in running an oval ring. I have been riding a 28T round ring for years. When it came time to replace it I purchased this ring in a 28T. I was amazed at how much less effort it took to climb the same hills. I soon felt that the 28T was too low as I kept hitting the 10T on the rear. I then bought a 30T oval and it feels just like the 28T round. I am a believer in oval now. Installation was easy and the ring went on without incident. It was also a good excuse to clean the bottom bracket and cranks. I have since went oval on my 1x Cross bike as well. I have owned 2 of these. Use it on my SS El Mariachi. Makes a difference in traction and power. A piece of art! Takes your pedaling to the next level. I have it on all my bikes. Night and day difference in pedaling. Round rings aren't rad these are. Buy one like yesterday. do it you know you wanna. True 6mm offset, matching SRAM's own sprockets. No obnoxious branding, just a nice clean finish. Took 5 minutes to get used to it. The fit and finishing is as good as anything out there. I believe the AB science for clocking and ovality is the industry standard. You can not tell you are pedaling an oval after the first couple strokes. Works absolutely as advertised! Excellent piece. I don't know why oval chain rings aren't original equipment. You can immediately feel the benefits just in pedaling and then the traction benefit is also very obvious. Stand up pedaling over leafy roots without slip. 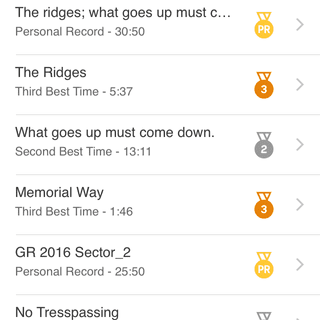 Got 11 strava medals at my most ridden spot the first time out and in less than ideal conditions. 2 personal records and 4 2nd places! Ripping. No doubt I'll set all new personal records come spring. It's hard to quantify the benefit of an Oval. In my opinion it's like having a 1 tooth smaller ring on the climbs with no loss of speed on the flats. You will notice the chain going slack at the non-power part of the stroke when pedaling lightly such as going down a slight hill. There is no derailleur motion if the top and bottom of the chain are parallel, however that is not usually the case on mountain bikes with small rings and large bail out gears on the cassette, so there will be some motion but not enough to burn up the clutch. The service is great thanks a lot jensonusa for your amazing service. Picked up the GXP for my long spindle(101.5 mm) XO crank arms. After installation and the first quirky get used to it ride. It starts to feel normal. I had to get over the feeling of different tension throughout the pedal stroke. Now after a fistful of rides, I'm liking it. I can't tell if it helps me out in any out of seat climbing but it does making climbing a little easier. Lives up to the advertising so far. I must pedal ovals and not circles. Took no time to get used to and on the flat pedal sections I was in the high gears earlier and longer than usual. It seems to actually live up to the hype. Time will tell on durability. I seems to be a lot faster during my ride in the same trails. Lighter, better alignment than my Sram star chain ring and cranks smooth. Really don't notice that it is oval. Super easy to install, saves weight of the spider, and I can probably go up one size (i.e. 30t to 32t). As always, price and ship times with Jensen are great - seems like I order and bam! it's there. when putting change in power from low torque condition feel slack in drivetrain, not sure if it's from rear mec tension or oval ring or combinaison of both, was not like this prior to make the change to this ring.. need to search a bit more on this issue . Thought I would try out the oval ring. Installed perfectly and looks great. Nice finish added a bit of bling!!! As far as feeling, I barely noticed any difference from the round to oval. It felt natural and took no time at all to adjust. I do have a couple of gripes. My bike came with a 28T round sprocket. I wanted to go to a 30T ring. Only problem is that the oval ring acts as 2 teeth more on the power stroke. This basically made my bike feel like a 28T ring to a 32T ring. It totally changed the low gearing for the steep climbs. Unfortunately, a 4 tooth difference on the ring, my legs are not strong enough to compensate. Had to hike a bike up a few steep sections my first couple of rides that I normally clean. I should of got a 28T ring or a 30T round ring. My bad.... Second gripe, if you run a chain guide for enduro type riding, it's near impossible to get it to work properly. Basically align it to the peak of the oval, and the second half of the ring has no coverage. In the Hope service video, the presenter uses a tool to install the freehub body. I didn't have the tool, so I just worked my way around with my fingers and a rubber ended tool. Took a bit of work, but easy enough not to need the specific tool. It came with the necessary end cap. All good. Does this ring have 6mm offset? 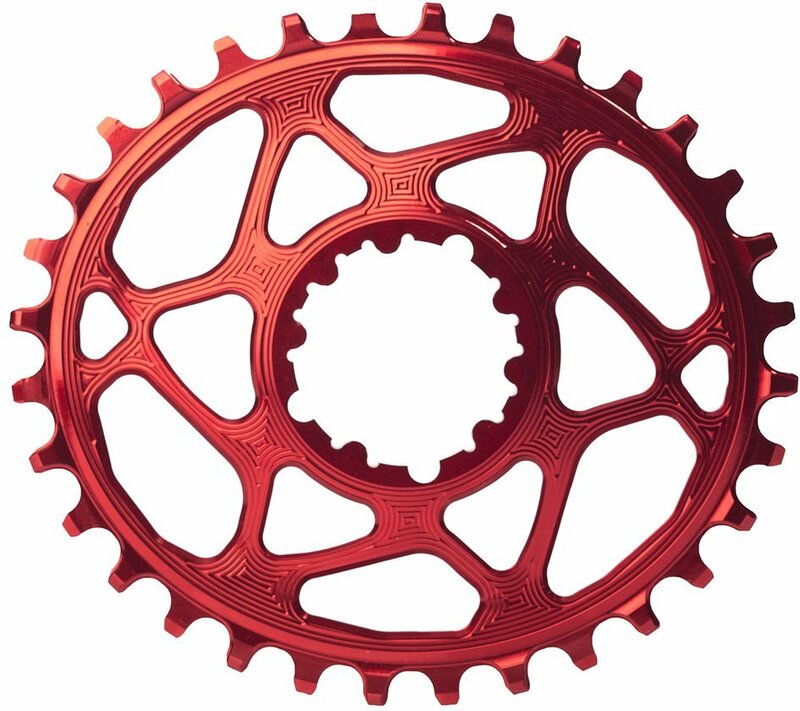 Does this fit on SRAM NX 1x11 Crankset? I didn't see it listed. It does not fit. The NX crankset does not have a removable spider making a direct mount chainring incomparable. No, that ring will only fit SRAM cranks with a removable spider. No it does not. The NX doesn’t have a removable spider. Yes! As long as your NX crankset is GXP you are good. No... it should fit the new 1x 12 spec crankset. The pictured Gold chainring is the e*thirteen/Cich mount not the GXP mount. Is this just a photo mistake? does this sku have the 6mm offset (for gxp and long spindle bb30?) I'm attempting to match a model purchased a bit ago direct from AB in a different size. Thanks! Would this model with the 6mm offset work on a sram gx 1000 ? This model fits BB30 long spindle with removable spider per Absolute Black's website and I just mounted one to my bike with this style SRAM Crank. Does this chainring work with the dub bottom bracket set up? Does it work for SRAM XX1 eagle 12 sp? BEST ANSWER: I installed mine on my sram xx1 1x11 and it works wonderfully! Had on for a few thousand miles now and love it! I was surprised at the difference it made.